Looking for media resources, including a simpler FAQ sheet? Visit our press room. LightSail® is a citizen-funded project to test solar sailing technology for CubeSats. Solar sailing uses reflective sails to harness the momentum of sunlight for propulsion. CubeSats are small, standardized satellites that hitch rides to space with larger payloads. CubeSats have revolutionized the space industry, thanks in part to the continuing trend of technology miniaturization. They use off-the-shelf hardware and can be manufactured rapidly, which makes them an economical alternative to large satellites. CubeSats can test new technologies that aren't ready full-fledged missions, or fly single science instruments to measure very specific things like Arctic sea ice loss. Educators use CubeSats to give students real-world space experience at a fraction of the cost of large missions. Companies like Planet deploy swarms of CubeSats to blanket the Earth with daily imagery, while SpaceX hopes to use CubeSats to deploy a global broadband Internet constellation. One disadvantage to CubeSats is that they typically lack propulsion, which limits their range of applications. LightSail will demonstrate the viability of using solar sailing for CubeSats. The idea of solar sailing dates back to the 1600s, but the story of LightSail begins in the late 1970s, when NASA considered flying a giant solar sail to Halley's comet, and Planetary Society co-founder Carl Sagan promoted the concept during an appearance on The Tonight Show with Johnny Carson. The project was ultimately cancelled. The Planetary Society was founded in 1980. Scientific collaboration between the Society and Russia led to the creation of Cosmos 1, a solar sail spacecraft launched aboard a repurposed ICBM. Both the partial test (2001) and full flight (2005) of Cosmos 1 failed due to problems with the Russian rocket. The first successful solar sail finally took flight in 2010, when Japan's IKAROS spacecraft was deployed from a Venus-bound probe named Akatsuki. NASA has investigated using solar sails to de-orbit CubeSats with atmospheric drag. The first attempt, Nanosail-D, was lost during a Falcon 1 rocket failure in 2008. A follow-on mission named Nanosail-D2 was successful in 2010. 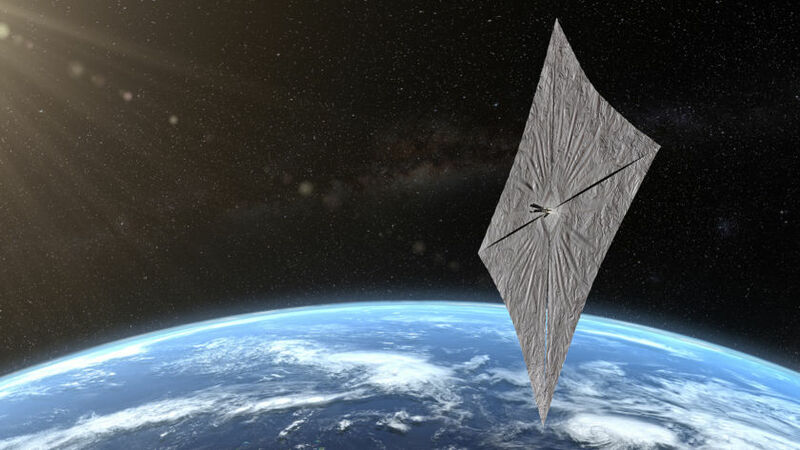 The Planetary Society's LightSail program, initiated in 2009, aimed to construct a CubeSat similar to Nanosail-D that would demonstrate true solar sailing. LightSail 1 was awarded a slot aboard an Atlas V launch in 2015, but the target orbit was not high enough for solar sailing thrust to overcome atmospheric drag. We accepted the free ride anyway, and flew LightSail 1 as a shakedown cruise to test the spacecraft's sail deployment mechanism. The mission was a success, and we downloaded a selfie of the spacecraft's sails in space. LightSail 2 will launch aboard SpaceX's Falcon Heavy rocket. The mission will attempt the second-ever controlled solar sail flight, and the first in Earth orbit. As a rideshare mission, LightSail 2's launch date depends on the readiness of the Air Force, which is in charge of the primary payload, and SpaceX, which operates the Falcon Heavy rocket. Prior to our flight, a Falcon Heavy will launch the Arabsat-6A communications satellite. In early March 2019, the Air Force informed us our official launch date is no earlier than 31 May 2019. Based on prior launch date changes for this mission, we wouldn’t be surprised if the launch slips later into 2019, and don’t currently advise anyone to make travel plans just yet. Rest assured that as soon as we have news to share about the launch, we will! LightSail 2 will be enclosed within Prox-1, a Georgia Tech student-built spacecraft the size of a small washing machine. Both spacecraft will be attached to the upper stage of SpaceX's Falcon Heavy rocket, which is launching a payload for the U.S. Air Force called STP-2. Prox-1 will detach from the Falcon Heavy into a circular, 720-kilometer-high orbit, and then deploy LightSail 2. After a checkout period, LightSail 2 opens its hinged solar arrays and unrolls four, tape measure-like sail booms, which pull the spacecraft's four triangular sails from storage. The sail deployment sequence takes roughly two minutes. LightSail 2 will then begin swinging its solar sails into and away from the Sun each orbit, giving the spacecraft enough thrust to raise its orbit (technically, the orbit semi-major axis) by several hundred meters per day. This portion of the mission will last one month. LightSail 2 makes 90-degree turns to gradually raise the semi-major axis of its orbit by several hundred meters per day. LightSail 2's attitude control system does not have the precision to maintain a circular orbit. Therefore, as one side of the spacecraft's orbit rises, the other side will dip lower, until atmospheric drag overcomes the forces of solar sailing, ending the primary mission. The spacecraft will remain in orbit up to a year before succumbing to destructive reentry. 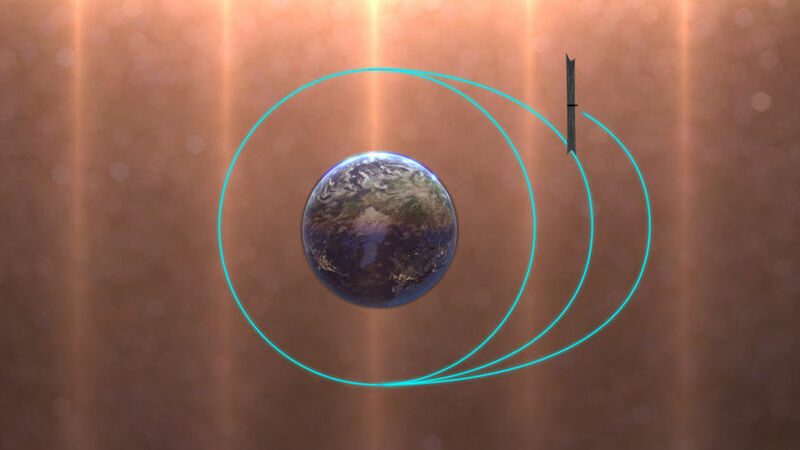 Though LightSail 2 cannot raise its orbit indefinitely, this would be possible by angling the sail more precisely during each orbit. Will Prox-1 image LightSail 2? No. Though Prox-1's imaging hardware was integrated at the time it was delivered to the U.S. Air Force for launch, the software required further development, and the mission scope was changed. Won't space debris and micrometeorites punch holes in LightSail 2's solar sails? The sails use a "rip-stop" design with seams every few inches. A puncture from a micrometeorite or space debris shouldn't spread very far. 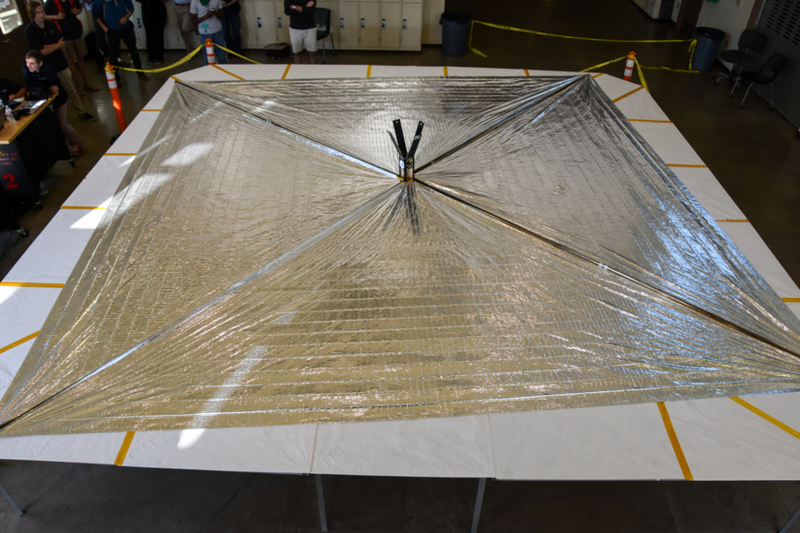 LightSail 2 can withstand small impacts without suffering any major mission impact. How is LightSail 2 different than LightSail 1? Appearance-wise, the spacecraft are nearly identical. 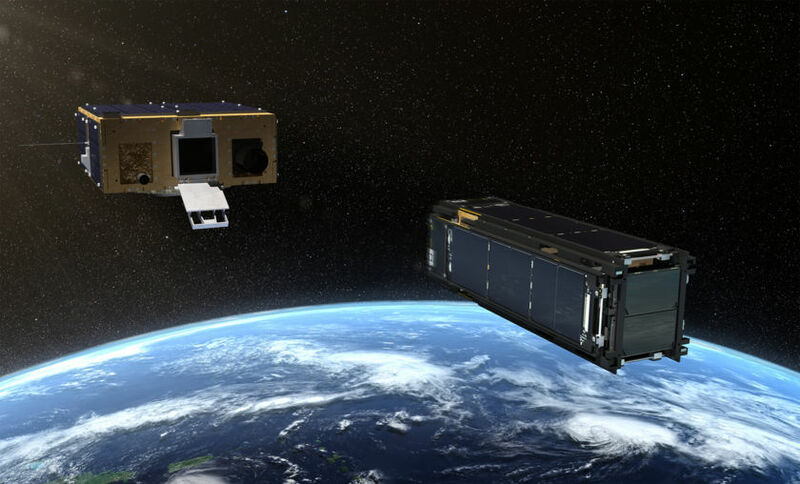 LightSail 2 has a momentum wheel allowing it to rotate its sails toward the Sun's rays each orbit, and a cluster of small mirrors have been added to one end of the CubeSat to allow for ground-based laser ranging. LightSail 2's software has also been completely overhauled to correct bugs that were discovered during the first mission, and improve the quality of data the team will receive on the ground. The Planetary Society's LightSail 2 spacecraft sits on its deployment table following a successful day-in-the-life test at Cal Poly San Luis Obispo on May 23, 2016. I have a specific question about a piece of LightSail hardware. Check out our academic resources page for schematics, models, and a parts listing of all the spacecraft's major components. I have a specific question about LightSail's software. Is it open source? The software is Linux-based and authored under the guidance of Cal Poly San Luis Obsipo. There is no open-source version of LightSail's specific software, but you can download all available Cal Poly CubeSat software on their GitHub page. Funding was provided by Planetary Society members, private citizens and a KickStarter campaign that raised $1.24 million in 2015. Design and construction: Stellar Exploration, Inc.
LightSail 2 will fly in a 24-degree inclination orbit, which will keep it much closer to the equator than LightSail 1. We estimate this will restrict viewing to latitudes less than 42 degrees north or south (at 42 degrees, LightSail 2 will never rise higher than 10 degrees from the horizon). 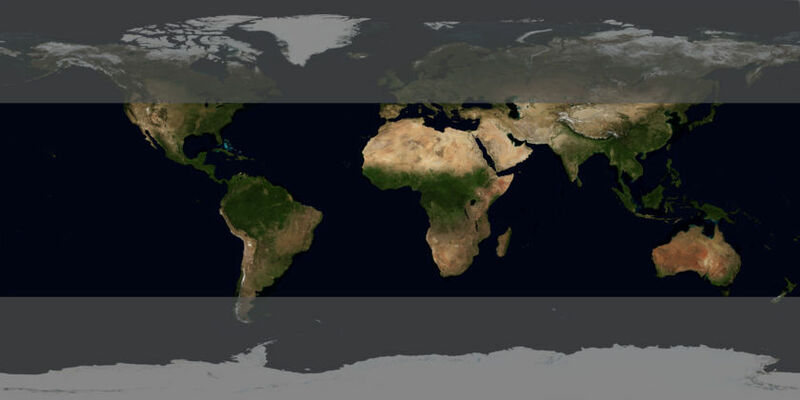 LightSail 2 will fly in a 24-degree inclination orbit, which will keep it closer to the equator than LightSail 1. We estimate this will restrict viewing to latitudes less than 42 degrees north or south (at 42 degrees, LightSail 2 will never rise higher than 10 degrees from the horizon). North America: Locations north of Chicago and New York will not be able to see LightSail 2. South America: LightSail 2 should be visible everywhere except for southern Argentina and Chile. Europe: LightSail 2 will not be visible in the U.K., Germany or France, but more southern spots like Madrid and Rome will be able to see it. Asia: Most of Japan and China will be able to see LightSail 2, but Russia is too far north. Africa: LightSail 2 will be visible anywhere in Africa. Australia: LightSail 2 will be visible in all of Australia, and in northern parts of New Zealand. We'd love to see your photographs of LightSail in space! Share them on social media using the hashtag #LightSail2, or email us at [email protected]. You can download the beacon structure here. Are you an engineer, academic or space enthusiast looking to build on our work? Visit our resources page for schematics, links to peer-reviewed papers, and parts lists. Light is made of packets of energy called photons. While photons have no mass, they have momentum. Solar sails capture this momentum with sheets of large, reflective material such as Mylar. As photons bounce off the sail, most of their momentum is transferred, pushing the sail forward. The resulting acceleration is small, but continuous. Unlike chemical rockets that provide short bursts of thrust, solar sails thrust continuously and can reach higher speeds over time. Sunlight is free and unlimited, whereas rocket propellant must be carried into orbit and be stored onboard a spacecraft. Solar sailing is considered one possible means of interstellar space travel. How can solar sailing be used for interstellar travel? Won't the sun's rays have less effect as the sail moves farther from the Sun? Yes, but only acceleration, not speed, will decrease. At Mars, the mean energy flux from the Sun is just 43 percent of what it is at Earth. At Jupiter, it's just 4 percent. So roughly speaking, beyond Mars's orbit, a solar sail quickly becomes ineffective. For missions destined to leave the solar system, theorists have proposed either building up speed in the inner solar system, using supplemental lasers, or both. How big a payload could a solar sail carry? The key metric for solar sail performance is area-to-mass ratio, or A/m. Basically, the push your spacecraft gets from sunlight depends on the relationship between sail area and vehicle mass. The higher your A/m ratio, the better. IKAROS, the Japanese solar sail launched in 2010, has an A/m ratio of 1.3. LightSail 2, which weighs less than 5 kilograms, performs slightly better, with a ratio of 7. For large payloads, you need large sails. In the late 1970s, NASA designed two solar sails that would have visited Halley's comet with 1-metric-ton payloads, placing them on the order of the New Horizons probe that visited Pluto. One design, a square sail, measured 850 meters per side, giving it an area of 0.7 square kilometers. A second design, called the heliogyro, resembled two ceiling fans stacked on top of one another, and had 8-meter-wide blades that were 6.2 kilometers long apiece. Could a solar sail carry humans? Yes, a solar sail could, in theory, carry any type of payload. Does a solar sail fly on the solar wind? No. Solar wind is made up of ionized particles ejected by the sun. These particles move slower than light and create a force less than one percent as strong light pressure. Solar sails fly solely on photons. How fast is LightSail 2? 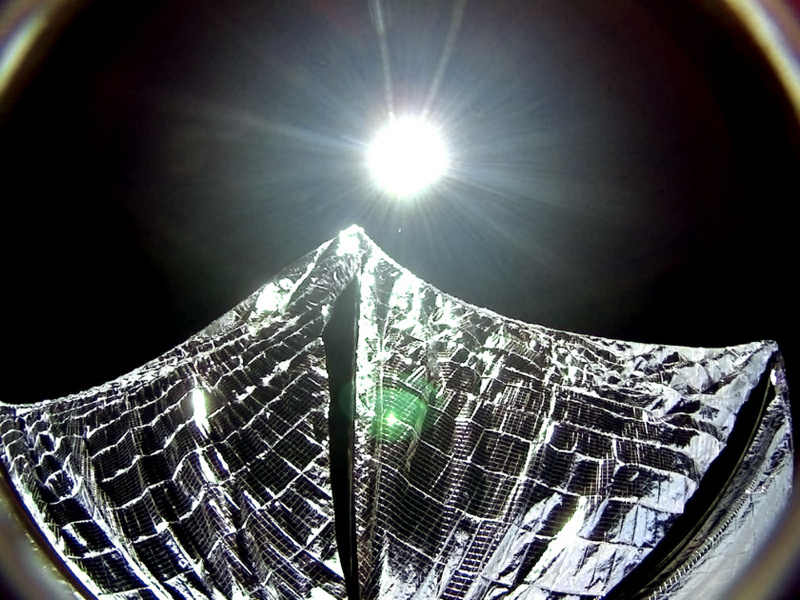 Assuming perfect reflectivity, the sun exerts a force of 2.91x10⁻⁴ N/m² on LightSail's 32-square-meter sails. The resulting acceleration is 0.058 mm/s². That's about as much force as a paperclip exerts on the palm of your hand. In one month of constant sunlight, LightSail's speed would increase by 549 kilometers per hour, roughly the speed of a jet airliner at cruising speed. In 16 months of constant sunlight, LightSail's speed would increase by 8,556 kilometers per hour, fast enough to escape the moon's gravity well. How can light have momentum if photons have no mass? Isn't the equation for momentum p=mv? Yes, but p=mv only works for non-relativistic masses. This allows photons to have momentum, and that momentum can be transferred to another object like a solar sail. LightSail 2 is inherently a technology demonstration mission. One of our biggest goals is to help pave the way for more advanced solar sailing CubeSat technologies. We currently don't have plans for a follow-on mission. 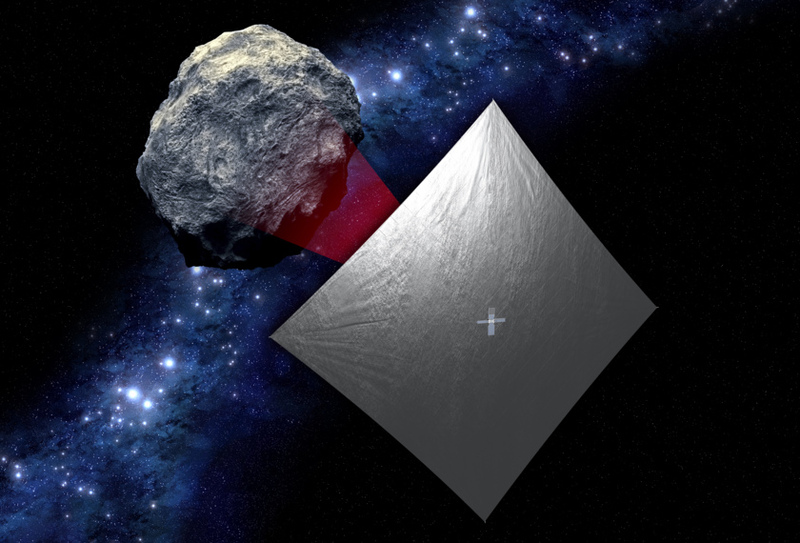 NASA's NEA Scout mission will hitch a ride to lunar orbit aboard the Space Launch System in 2020, and use a solar sail to visit a near-Earth asteroid. The Planetary Society is already sharing LightSail data with NEA Scout engineers and program managers to help inform their mission. In 2016, the group Breakthrough Initiatives announced a bold initiative to send a fleet of laser-powered solar sails to our nearest star, Alpha Centauri. The plan builds on The Planetary Society's long history of solar sail projects. Another spacecraft called CubeSail will soon take the first steps toward building the heliogyro envisioned by Planetary Society founders. 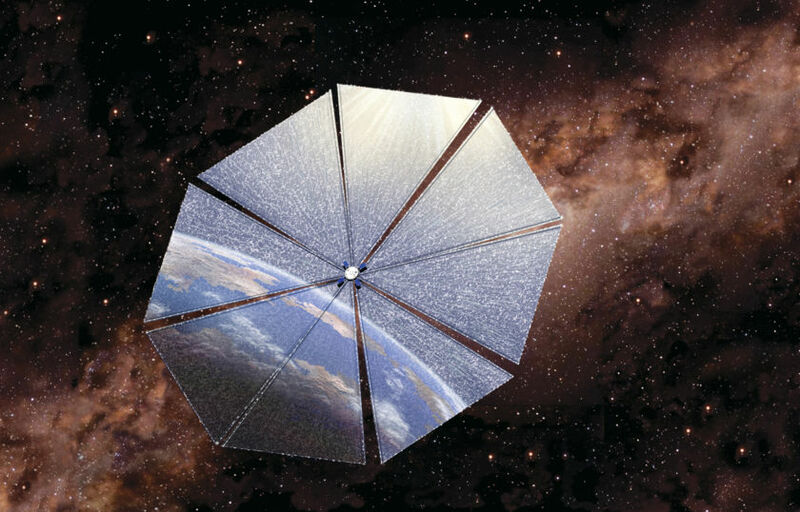 Other groups are experimenting with using solar sails to dispose of defunct satellites. While this technique does not necessarily rely on sunlight for propulsion, it builds on the concept of packaging large sails into small areas for deployment in orbit.